In Chicago, Violence Soars And Witnesses Go Silent As the number of shootings goes up, police are making fewer and fewer arrests for those violent crimes, leaving a staggering number of cases unsolved. Police blame a long-standing attitude for the failure to make arrests: you just don't snitch to police. It's an old problem and an old code — "don't snitch." And it exists everywhere. When police can't find and arrest the perpetrators, they worry that the shooters will soon shoot again. "It's very frustrating," says Chicago Police Sgt. Cesar Guzman, a detective with the department's violent crimes unit. He describes one of the city's hundreds of unsolved shooting homicides, which happened earlier this year on the city's impoverished west side, along a wide boulevard. "It was a hot summer night," he says, adding "a lot of people were out." Guzman and neighbors in the area say there were cars parked along the boulevard, many with their windows open and music playing. A few kids were playing in the wide grassy median, while adults stood watch talking and laughing. Some were drinking and smoking. At the corner of one of the side streets, two men started arguing. "And then after the verbal altercation, the offender drew a weapon and shot at the victim, striking the victim multiple times," Guzman says. The victim was 23-year-old Dominique Green, known in the neighborhood as "Snoopy." Paramedics rushed him to a nearby hospital but with five bullet wounds in his torso and two in his head, Green was dead on arrival. The first few hours of an investigation are the most important, and locating eye witnesses is critical to solving such a crime. So Guzman and other detectives immediately started canvassing the neighborhood. "And what was surprising is, no matter how many times ... I mean, we're looking, we're stopping people to see if they heard or saw anything, and most people would say no, they didn't see anything, they didn't hear anything, and they continued to walk by," Guzman says. "And that's one of the frustrations that we have to deal with when we come to areas like this, is that it's not easy to find witnesses." Investigators believe the shooting was gang-related, Guzman says, and many people in Chicago's gang-dominated neighborhoods are just too afraid of retaliation to talk to police. But he and other police officials also blame a long-standing attitude that police say appears to be becoming more widespread in many communities: that you just don't snitch to the police. Guzman says within Chicago's deeply entrenched gang culture, even shooting victims often won't cooperate. "They know who shot 'em and there's a very strong possibility that they're going to take matters into their own hands," Guzman says. "And then we're going to have another shooting later on." In fact, police officials say a spike in retaliatory shootings is part of what is causing the homicide rate in Chicago to increase more than 20 percent so far this year over 2011. And as the number of shootings goes up, police are making fewer and fewer arrests for those violent crimes, leaving a staggering number of cases unsolved. According to Chicago Police statistics, there were close to 1,800 nonfatal shooting incidents in Chicago this year through the end of September. In almost 80 percent of those cases, detectives were forced to suspend the investigations because they had no workable leads. Chicago resident Stanley Jackson says there is a code of silence when it comes to witnessing crime. "And most of those are gonna be from lack of cooperation, quite frankly," says Chicago Chief of Detectives Thomas Byrne. "So a detective arrives to a scene, witnesses are not cooperating, victims not cooperating. It makes it very difficult to piece the puzzle together on what happened," he says. When it comes to homicides, the chances of police making an arrest are not much better. 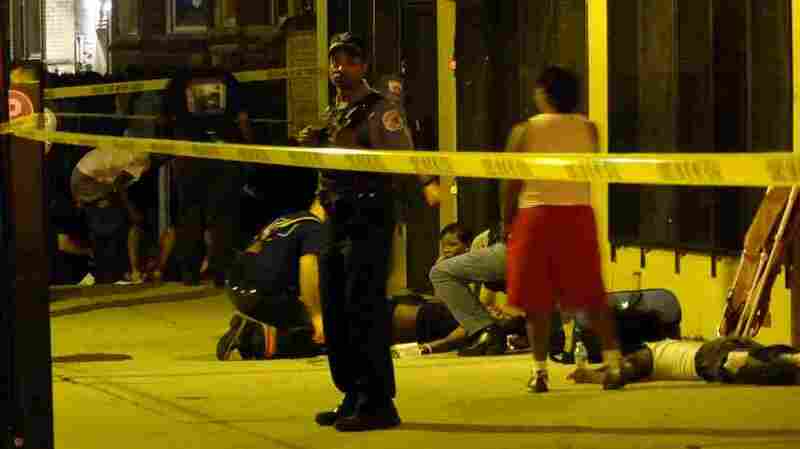 The clearance rate for last year's 433 homicides in Chicago was just 30 percent. In other words, 7 out of 10 times, murderers in Chicago get away with the crime. Twenty years ago, the clearance rate in Chicago was near 70 percent, and there were more than twice as many homicides a year back then. The union representing Chicago police officers says one factor in the low clearance rate is that there are fewer detectives now. Chicago Police officials refuse to disclose specifics on staffing within the detective ranks, but Byrne acknowledges it is a fair question. "Everybody wants more people," he says. "I'm not going to lie — everybody would like more people, but you have to operate in the parameters that are set." Those parameters, Byrne says, include financial constraints. He says recent promotions are helping ease the caseload for detectives in violent crimes and new hiring should lead to more police promotions into the detective ranks soon. He adds that it doesn't matter how many detectives are working a case if no one will talk. Byrne calls the "don't snitch" culture frustrating. "If we get some cooperation, we're going to take a shooter off the streets of the city of Chicago. I mean, that's the bottom line," Byrne says. "If that shooter shoots today and nobody comes forward or a victim doesn't step forward and do the right thing, that shooter's still out there tomorrow. And if he's shooting today, I guarantee you he's going to shoot tomorrow. And that's some of the frustration that goes with it." But those who live in Chicago's gang and crime-ridden neighborhoods see things quite differently. 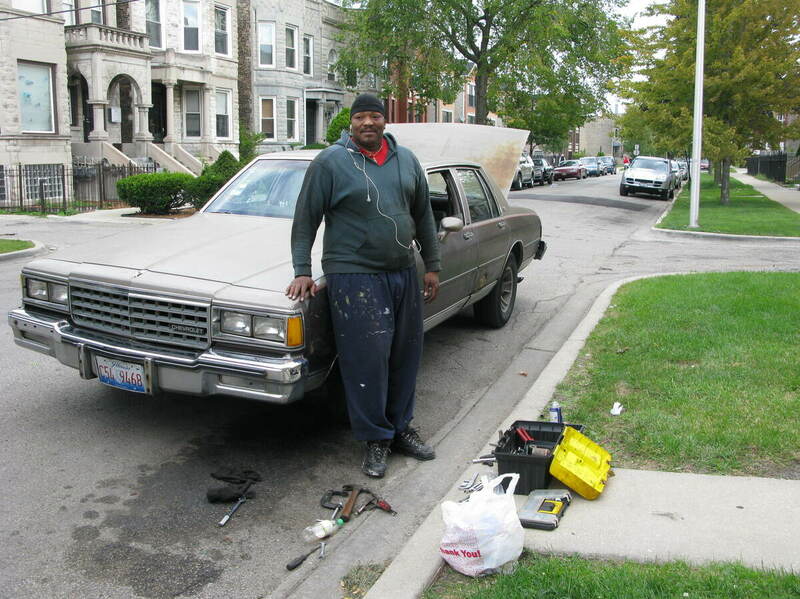 Stanley Jackson fixes his car on the street, 100 feet or so away from the spot where Green was shot dead just a few weeks earlier. The 43-year-old security officer says he wasn't out that night, but he has heard some about what happened. And he understands why those who were out that night won't tell police what they saw. "Even if you did see something, you don't know nothing. Basically, the fear of either they'll shoot your kids, or they'll try to get you, or if they can't get you, they'll get somebody in your family," he says. "It's that old code of silence thing, you know?" Others in this community say there's even more than fear that is keeping many people in this neighborhood from coming forward to police as witnesses. "It's that they don't trust police officers," says 54-year old laborer Sherman Smith. "Police patronize you, man. Police over here, they don't protect and serve. They patronize," says 21-year-old Joenathan Woods. Woods, who works on an automotive assembly line, says he doesn't think police put much effort into investigating crimes such as the Green shooting, especially if it appears to be gang-on-gang and happens in poor, black neighborhoods like this one. "The only thing I can really think of that would help the community really is if the police are more hands-on in serving and protecting, you know what I'm saying? If they walk the streets and get to know the people," Woods says. Criminologist Art Lurigio agrees that Chicago police need to do a better job earning people's trust. "The police are responsible for creating an atmosphere in a community that encourages residents to come forward and cooperate with them in solving crimes," he says. Lurigio, a professor of psychology and criminology at Loyola University Chicago, says the city's community-policing strategy had been making progress in reducing violent crime since its implementation in the mid-1990s. But, he says, the department seems to have de-emphasized community policing in recent years. Without a better effort witnesses won't come forward, he says, and without witnesses identifying the shooters, shootings are extremely difficult to solve. And that's something he says the shooters know all too well. "I believe, and so do some other scholars, that there's a general sense in communities where the homicide clearance rate is very low, that they're getting away with murder," Lurigio says.